TV: The return of Star Wars: The Clone Wars to Disney’s direct-to-consumer streaming service! Categories: Books, Clone Wars, Comics, Podcasts, Star Wars TV, Toys, Video | Tags: Clone Wars, SDCC, SDCC 2018, Star Wars, Star Wars Books, Star Wars Comics, Star Wars Novels, Star Wars Podcasts | Permalink. 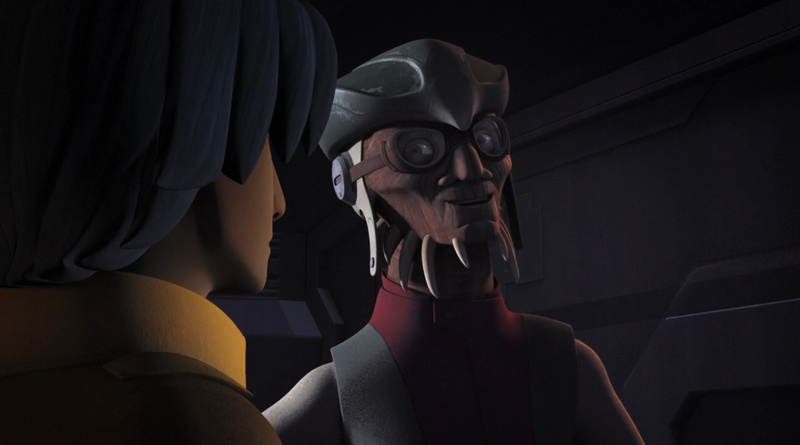 The newest episode of Rebels, “Brothers of the Broken Horn,” is the lightest and most humorous we’ve seen since probably “Idiot’s Array” in season one, so for this Rebels Screenshot Spotlight I’m choosing an image that highlights the always entertaining weequay pirate Hondo Ohnaka. “Brothers of the Broken Horn” ends with Ezra’s realization that a pirate life is not for him as he knows he has a more selfless path in front of him. Still, Hondo and Ezra shared a brief adventure and though this shot of the two of them together is simple and straightforward, I thought it was a nice moment between the two of them and a good representation of the episode as a whole. As a Clone Wars character returning on Rebels, it’s also interesting to look at how Hondo’s design has been simplified to match the aesthetic of the newer show. I’ve always loved Hondo (and I’m not alone, as he’s certainly a fan favorite), but I find him even more charismatic and appealing in his Rebels incarnation. 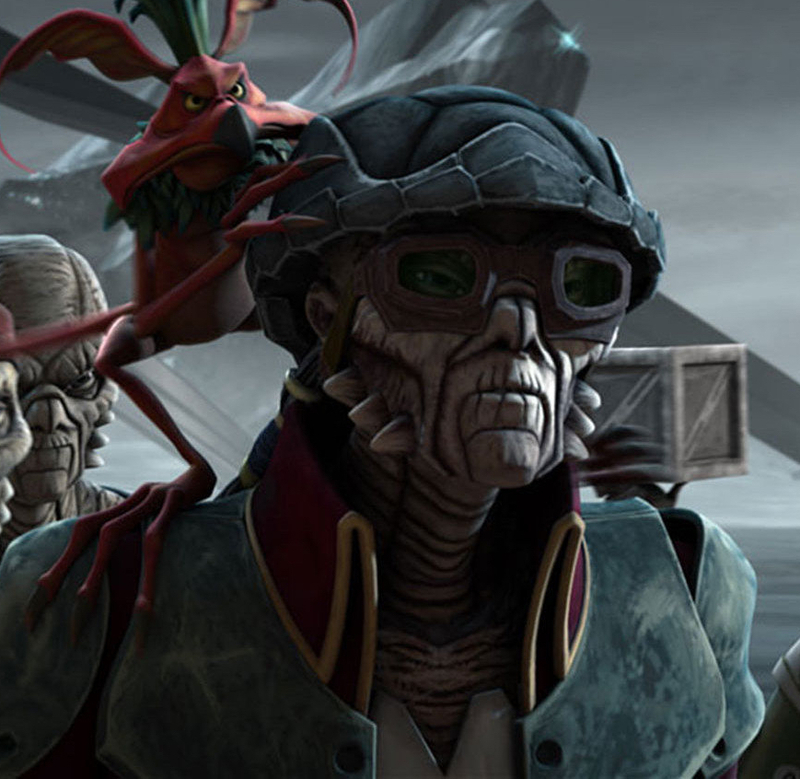 I prefer the more cartoonish feel of Rebels and a character like Hondo exemplifies how warm and welcoming the show’s look is in comparison to the approach of Clone Wars. Some fans expressed disappointment in “Brothers of the Broken Horn” because it lacks the drama and weight of other episodes of Rebels, but I was happy to see Hondo return and I don’t mind a lighter episode now and then to balance out the darker ones. I’m happy to have the old pirate back, and while I hope they use him sparingly going forward, I’m hoping to see him again when the arc of the show calls for a bit of levity. Categories: Rebels, Rebels Screenshot Spotlight | Tags: Brothers of the Broken Horn, Clone Wars, Dave Filoni, Ezra, Hondo, Hondo Ohnaka, Rebels, Star Wars, Star Wars Clone Wars, Star Wars Rebels | Permalink.